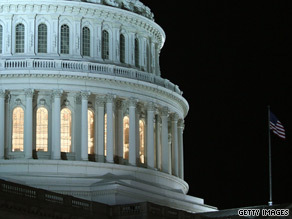 The Capitol dome on the eve of the House of Representatives’ health care reform votes. Washington (CNN) - A majority of Americans have a dim view of the sweeping health care bill passed by the House, saying it gives Washington too much clout and won't do much to reduce their own health care costs or federal deficits, according to a new poll released Monday. The poll's results about the bill's fiscal impact were particularly stark: 70 percent of respondents said they believed deficits would go up because of the bill; 17 percent felt they would stay the same and 12 percent said they would go down. After more than a year of partisan debate, the House voted 219-212 in favor of a bill that the Senate had passed on Christmas Eve. President Obama is expected to sign it on Tuesday. The measure constitutes the biggest expansion of federal health care guarantees since Medicare and Medicaid were enacted more than four decades ago. The House also approved a series of amendments to the bill through a separate so-called reconciliation bill. The Senate, which must pass the reconciliation measure for the full package to take effect, is expected to vote this week. According to a preliminary estimate by the Congressional Budget Office, the overall reform legislation would cost $940 billion over the course of a decade. Offsetting provisions would reduce deficits by $143 billion in the first 10 years and by more than $1 trillion in the following decade. The CNN poll also suggests that public opposition to health care will not necessarily be a boon to Republicans in the 2010 midterm elections in Congress. Roughly one in five of respondents who said they opposed the bill did so because it was not liberal enough, and those people are unlikely to vote Republican. Take them out of the picture and opposition to the bill because it is too liberal is 43 percent. "The Democrats have another advantage - most Americans also trust Barack Obama more than the GOP on health care," said Keating Holland, CNN's polling director. "That gives the president an opportunity - and seven months - to make the affirmative case for the health care bill." The survey was conducted on March 19-21 through telephone interviews with 1,030 adult Americans. The poll has a margin of error of plus or minus 3 percentage points. The headline of your story misrepresents the numbers you get in your survey and gives a fodder to republicans. One of the most important numbers in the survey is that 13% of the people oppose the bill because it is not liberal enough. These are the people who probably are unhappy with the bill because it doesn't have a public option. However, it should be obvious to anyone that this group will prefer to have the current bill rather than having nothing or having any republicant plan which are tiny tweaks to the current system. What this essentially means that only 45% of the people are really unhappy with this bill, while 52% are either satisfied or would want an even more liberal bill. Didnt seem to matter what the American people wanted. Nov. will be here soon enough. Where are the internals? Let's look at it. Three words: Americans are dumb. Sounds like the Dems' job is not done. When asked about specific benefits from the bill, such as the reomval of pre-existing conditions or lifting annul/lifetime spending caps, most Americans are in favor. If the press would actually do some real reporting, and interviewers who should know better would challenge the liars out there, Americans could get the facts instead of the scare tactics. Trust me – by November everyone will be a fan of this bill and the GOP will claim that they were responsible for its passage! what part of the "we the people' do not want government run health care and spend..spend..spend.. did our elected officials did not understand? Let's repeal Medicare and see what they think. It's time for CNN to find a new group of people to survey. The poll results are a far cry from the views of people in my area. What a joke! The joke of a poll for today. I think the CNN pole is more a reflection of some deceptive advertising that had saturated the airwaves as the debate was happening. Most of those survey probably have little idea what is actually in the bill and the rhetoric contained so many distortions and fabrications, it would be hard many to have an objective opinion. of course we don't support this baby killing bill! Not only do we NOT like it, We hate it. This is being crammed through against our will and being told it is for our own good. We know what a disaster it is and Obamas words are no longer magical, they are LIES and we have had enough. We the people should be voting on our healthcare instead of these Democrats making decisions for us..........Democrats don't think people are capable of taking care of themselves. "Roughly one in five of respondents who said they opposed the bill did so because it was not liberal enough, and those people are unlikely to vote Republican. Take them out of the picture and opposition to the bill because it is too liberal is 43 percent." Thank you, CNN for FINALLY doing your journalistic duty and making it ABSOLUTELY CLEAR that it's NOT a monolithic block of 59% who agrees with the TEA/FOX crowd. But you're just finally doing this NOW? By allowing lies and misinformation be repeated ad nauseum over the past year, you contributed to the toxic climate we saw this weekend. I've blocked CNN on my TV, and I will only unblock it if and when you grow a spine. The people who don't have health care are Americans too. If you are one of those Americans that don't like it, then don't use it. Problem slove as simple as that and get over it. These numbers say that 51% of those polled either FAVORED this bill or FAVORED an even more liberal reform. 47% apparently favor less liberal reform, or no reform. Thus, Republican congressmembers' constant claim that liberal health reform is "against the will of the people" is a LIE. For many people, the reality is that health insurance premiums will go up. Sure, I don't like everything in the bill. But if I need health insurance and can not afford to pay for it. Who will help? but if I don't have health insurance, and need it, the cost still will be there or suffer the consequence of not having health insurance for treatment or prevention? So either way health cost will be there one way or the other. I'm not fond of the mandate on health insurance, but if I can get help to pay for health insurance and more options to choose, then what's wrong with that? health care is a reality of life, not an option of life. I believe a start to a reform is better then nothing at all. I don’t put much faith in this poll, and here are my reasons why. How many people polled actually took the time to conduct their own research on Health Care Reform (HCR), and formed their own opinion about it, and are not regurgitating someone else's. This is what disturbs me. Too many people are borrowing other people’s opinions. When people do that, they are giving up their inalienable right to form an opinion of their own. They are restricting their own freedom. It’s not being taken away. We as American's need to have the personal fortitude to do our own research, and come to our own conclusions based on facts that we uncover ourselves, and not on the opinions of others. Don’t trust the politicians, or the media to do it for you. In the end, they only serve themselves. The fact is we, America, did vote for HCR. We voted for it by putting Obama in office. HCR was the platform on which President Obama ran his campaign. Some American’s only waiver now, because of the self-admitted fear mongering tactics of the republicans and several prominent radio conservatives. From the beginning, President Obama did give the GOP an opportunity to be a part of this bill. The GOP refused. They removed themselves from the process. They weren’t forced out. With the GOP refusing to be a part of the HCR bill, President Obama did not have a choice but to continue in a partisan manner. It is true, that some Democrats withdrew support from the bill, but, it was not because they don’t believe in HCR, it was because that wanted a certain passage included, or omitted from the bill, and it took a while to find a balance to get the bill passed. In the end, President Obama did the right thing. Like a parent dealing with a child that doesn’t like vegetables, he is making us eat them anyway, because he knows it’s for the greater good.